When Älmhult changes its name to Kamprad. The town of Älmhult had not been the same without its Ikea. To name a small street or avenue after Ingvar Kamprad (the founder of Ikea) is worth little more than a used Billy shelf when it comes to honouring such a big legend. That’s why we think it’s a good idea to give the city a name that commemorates how he has furnished the world since 1943! Invite all 100 million members of the Ikea family to Kamprad. Design and sell a tent for 19 SEK, which can only be purchased at Ikea in Kamprad and name the tent after SVEA. The municipality could offer some land to camp on during Kamprad’s annual camping month of July and sell the Municipality´s brand. Media would of course love it and what the tent would look like is of course as obvious as Ikea’s original logotype – a Swedish blue-and-yellow flag, which will welcome everyone to get in to the tent and sleep well – as well as ever in SVEA. Next week I will hold a trendspotting lecture on Customer`s Insight & Futures. There will be two full-featured programs with speakers from C More, HSB, Avanza, ICA, DHL etc. There are still some tickets left for fast movers at Insightevents: Future Customer Service & Contact Center 23-24 October. The fall of the influencer. Thanks Jack Yan and Portia Gascoigne this is the best post I ever read on Lucire and by fare the most spot on, regarding the social media evolution. Love the point and the term ‘fake news’vs “fake lives”. Walking with 260.000 book lovers at the Frankfurter Book Fair. Really great to meet people how have the passion for books. 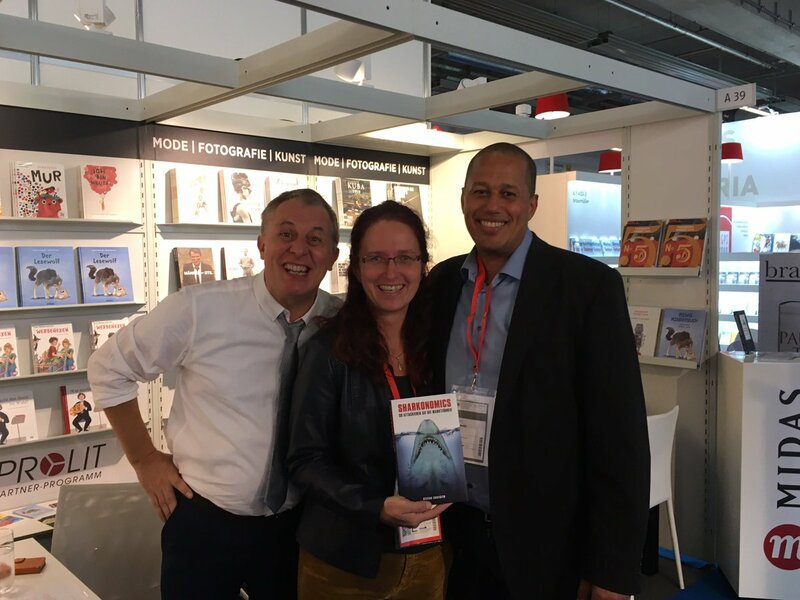 My German Sharkonomics Dream Team Gregory, Claudia and Nadine (missing from picture) from Midas Verlag AG at the Frankfurter Book Fair. Tension is the heart muscle of creativity. Facebook would win the Nobel Prize if they where a peace project. Social media autobahn to increased sales or not? I have the honor to hold full day lectures/workshops for leaders in purpose to deliver understanding in how improve profitability and customer satisfaction. Selldorado is one of the absolutely best networks that arrange seminars in Sweden! Selldorado (Google translation, in Swedish). October 11th in Stockholm is great speakers as Gunilla von Platen, Lina Gebäck, Linn Frisinger, Arvid Axland, Jesper Ek and moderato Francesca O’Brien Apelgren on stage. Check out and find your tickets on Tendensdagen: One of Scandinavia’s most eminent marketing conferences (still tickets to buy).